For some of us, a home security systems comparison between do-it-yourself (DIY) and professionally installed systems is totally unnecessary. If you’re an experienced home handyman or handywoman, you might readily take on an alarm system installation like any other household project. At the other extreme, if you know you’re all thumbs when it comes to tools, you may happily choose to let the alarm professionals come in and do their thing. What kind of system should I get? How much money will I save by doing it myself? How long will it take to install a system? If you’re debating whether to tackle a DIY alarm system yourself or just have an alarm company install one, you’ve come to the right place. To help you decide which way you should go, let’s look at the main details you should consider. Different types of systems give different levels of security coverage, and require different amounts of equipment and time to install. Check out these examples to get an idea of what kind of protection you’re looking for. For simplicity, I’ll use the terms “Complete”, "Basic”, and “Plug-N-Play” to describe the 3 main kinds of alarm you’ll want to consider. Complete security systems, either hardwired or wireless, are what most people think of as a “traditional” security systems for home use. Also known as whole house security systems, these will protect all or most perimeter doors and windows, along with motion detection in a few key areas. Additional protection will often include glassbreak sensors, panic buttons, and non-burglary protection such as smoke and carbon monoxide (CO) detectors. 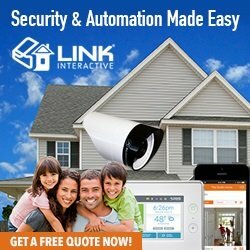 A complete wired home security system will likely take professionals 2-3 days or more to install, depending on the size of the home and the exact equipment used. For you as a homeowner, this may translate into 2-4 weekends to complete for hard wired home security systems. Wireless systems are usually quicker to install, but tend to require a bit more programming to get “up and running”. Complete systems usually use central station monitoring via phone lines, cellular transmission, or an internet connection. Central station operators will dispatch police, fire, or other authorities based on the alarm signal received. 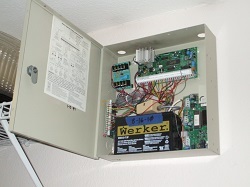 Basic systems are usually wireless, and include perimeter sensors on some doors and windows. They are often of the all-in-one design, using a single unit control/keypad/receiver with separate wireless transmitters. A very basic system would protect only the doors, and include a motion detector or two. Non-burglary protection like smoke and carbon monoxide detection may be included as optional items, just like with a complete system. Basic systems are regularly installed by the pros in less than a day. You could expect to install one in a day or two. 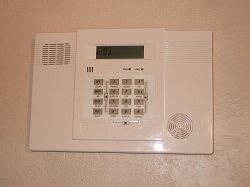 Basic alarms can use the same home security system monitoring as complete systems, providing an appropriate response based on the alarm signal sent. Plug-N-Play (PNP) systems are typically a single device, designed to be self-installed by a homeowner. These are wireless security alarm systems, though some require a hardwired internet connection for reporting. They generally don’t cover any doors or windows as such; rather, they passively detect motion, audio, and other conditions to determine a pattern of “normal” activity within the home. Many of these systems don’t even require that you arm and disarm them like a typical alarm system. Plug-n-play systems can only detect activity in a limited area, so they are best suited for apartments, condos, and townhomes. Installing a plug-n-play system can literally take just a few minutes, due to the nature of the design. The main unit requires an electrical outlet for power. and most will also need an internet connection, either wired or via Wi-Fi. Most PNP systems require you to self-monitor them. They detect activity in the home, and trigger an alarm when that activity deviates from the “normal” condition. The system then sends an alert signal to your mobile phone, pager, or other device. You must then decide whether to go home to investigate yourself, call a friend, neighbor, or call the police. If you’re leaning toward a professional installation, why not get a few free alarm quotes from dealers in your area? Knowing how much a system would cost can help you make a decision. Likewise, if you’re considering a DIY installation, getting price quotes will show you how much you can save by doing it yourself. You can expect the overall cost of a basic or complete DIY home security system to be lower than a pro install, since you’re saving one of the biggest expenses: Labor. However, the initial cost may very well be higher. This is because with a DIY system, you'll need to buy the equipment outright. With a pro installation, the equipment cost is often combined with the labor and monitoring fees, and is spread out over months. This is exactly what’s happening when you see companies offer a “free” home security system. 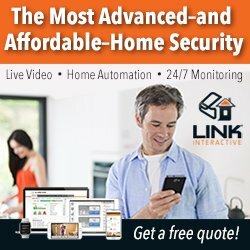 A “free” or cheap home security system will also require you to sign a monitoring contract, and often pay an installation fee. The equipment initially costs you little or nothing, but the alarm company makes it up over months of monitoring fees. The bottom line on cost: If you're planning to have the system monitored anyway, a pro install may be easier to afford than a do-it-yourself system. If you don't plan on monitoring, or are going to self-monitor, a DIY system is the cheaper choice. 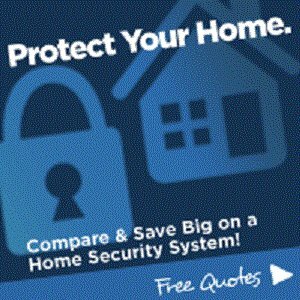 Learn more about what goes into home security pricing. When a pro company installs a system, you're also committed to using the monitoring services they offer. 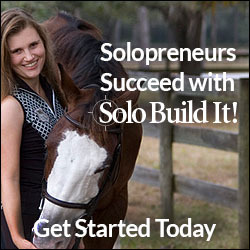 This will involve a monthly or yearly fee, and will require you to sign a contract for 2-3 years on average. This service may be just fine; if it's not, you won't be able to change services until the contract is paid off. With a do-it-yourself home security system, you can choose the monitoring method that best suits your situation (as well as no monitoring at all.) For example, you may not use landline telephone service, and instead rely on your cell phone. In that case, cellular or internet alarm monitoring might be the best choice. If you’re still using a landline, most alarm panels continue to support that. A DIY install will also allow you to shop around for the best monitoring rate. Discount alarm monitoring can be had for under $10 per month, which is considerably cheaper than most national alarm brands. Learn more about home alarm monitoring. If you’re planning on a DIY alarm installation, you’ll have to allow some time to order and receive the equipment, gather any tools needed, and perform the installation. After physically installing the devices, you’ll need to do at least some basic programming to make the system work. If you’re busy with work, school, taking care of the kids, etc., you may decide you’d rather “pick your battles” and let the pros handle the installation. Professional home alarm companies tend to have all the tools, equipment, and technicians necessary to complete a single-family home installation in a day or two, start to finish. There’s something to be said for experience; after installing and programming dozens of systems, most alarm installers know the stuff they use regularly inside and out. Then again, if you have the time and are looking for a challenge, installing an alarm system yourself can give you a sense of accomplishment. Not to mention, you can save some money! Monitoring options are up to you… Self-monitor, discount alarm monitoring, etc. Experience makes a difference. Pro installers have knowledge, insight, and tricks learned over dozens or hundreds of installs. Professional alarm installers are generally licensed, bonded, and insured, so you’re protected if there is any incidental damage done during installation. The best home alarm companies often have arrangements with drywall and painting professionals who can make any holes created during installation virtually disappear. Who should consider a DIY system? Who should consider a professional install? For more help deciding whether to go with a DIY or a professionally installed system, see "Is a DIY Home Alarm System Right for Me?" If you're leaning toward a professionally installed system, why not get a few FREE alarm quotes? This will help you make the best decision based on your needs, budget, and type of installation.